Below are some album.tour photos that I found from artists that meet similar conventions to the ones I wish to achieve. 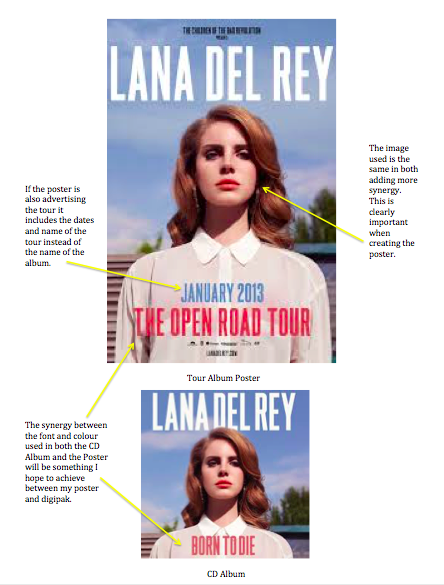 Both Lana Del Rey and Birdy use synergy between their digipak and album advert. This has been achieved by using similar text, font and photographs as those found on the digipak. I will reflect this within my own album poster through the use of the same font and images from the same theme. 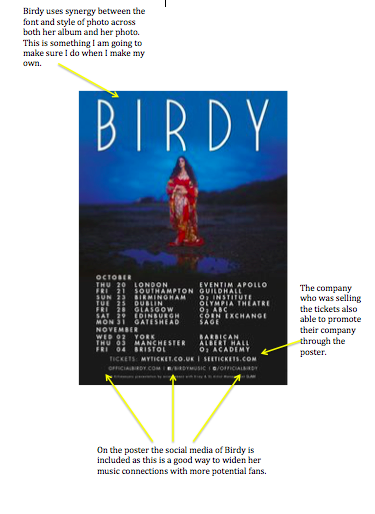 Birdy having the social media details on her poster is key to allow for fans to interact with the artist. 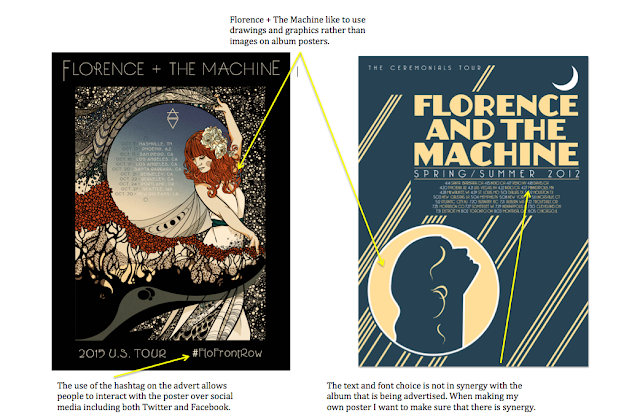 My own poster will contain social media links and also probably a QR code as well to Florence + The Machines website. I believe this is key in the 21st century as fans are always expecting more from the artists and the use of a QR code allows for further interaction. Also from my research and observations of the other album posters I realise you should include tour dates, the year, name of the tour and also possibly the record companies name. Florence + The Machine uses drawings in her own album posters and has minimal text, in the past this may have been effective. In the present day however I believe it is important to make it more interactive with social media. Also making the information clear and succinct will make the poster more eye-catching and attract more people to the poster and hopefully to buying an album.